bl.uk > Online Gallery Home	> Online exhibitions	> Asia, Pacific and Africa Collections	> Baini Sagor at Punna. 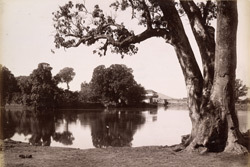 Photograph of Baini Sagor at Panna, Central India from the Lee-Warner Collection, taken by Deen Dayal in 1882. This print shows a tank at Panna. Panne is situated in northern Madhya Pradesh state, Central India. The city grew in importance when Chhatrasal, ruler of Bundelkhand, made it his capital in 1675.